This is a site devoted to the genealogy of the U.S. Presidents, emphasizing photographs of the Presidents and their ancestors, and with links to companion sites about the Presidents, the First Ladies and the White House. 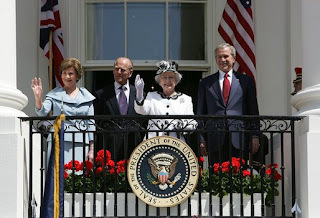 Queen Elizabeth of Great Britain has dined with 10 different U.S. Presidents, the most recent being with President and Mrs. Bush. Did you know that Queen Elizabeth is a direct descendant of George Washington's great-grandfather, Colonel Augustine Warner, Speaker of the Virginia House of Burgesses? Typically, whenever Queen Elizabeth travels to America, she puts a wreath of his grave in the Washington family cemetery in Westmoreland County, Virginia.